Home > Comics	> Metamorpho-Ho-Ho! 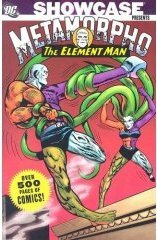 Over the past few weeks, my lunchtime reading material has been Showcase Presents Metamorpho, another in DC Comics’ recent series of black-and-white “phonebook” compilations. Its 500 pages of loopy goodness include the entire 17-issue run of the title character’s comic, as well as a half dozen of his most significant 1960s appearances. Metamorpho is in many ways an oddity. Despite a 40-year career, he remains a peripheral figure in DC’s pantheon, little known outside of geek circles. At the time of his creation, he was very much a product of his era, yet simultaneously a bizarre reflection of then-current trends in the superhero biz. Throughout the ’50s and ’60s, DC was revitalized by editor Julius Schwartz, who recast many defunct World War II-era characters in the mold of square-jawed, pulp science-fiction heroes. The Flash, Green Lantern, the Atom and Hawkman were among those Schwartz brought back from oblivion, giving them new, science-based powers and sending them on adventures into other worlds. In addition, DC created new heroes such as spaceman Adam Strange and the globe-hopping Challengers of the Unknown. In some ways, Metamorpho fit right in. As a shape-changing Element Man, he was a walking science lesson. Schwartz and crew worked a lot of science into their stories and sidebar features, even though a lot of it was dubious speculation at best, and often laughably wrong. Yet, Metamorpho was also an anomaly in the DC line, a reaction to the alarming popularity of rival company Marvel’s misfit heroes such as the Fantastic Four and the Hulk. (Ironically, Marvel’s success was inspired by the groundwork laid by Schwartz.) Metamorpho himself was anything but square-jawed: he was a pasty freak who desperately wanted to rid himself of his superpowers and return to human form. And like Spider-Man and the Thing, he was a wiseacre who happily made meta-commentary on the very notion of superheroes. Metamorpho was originally Rex Mason, a daredevil adventurer in the employ of billionaire genius Simon Stagg. We first meet Rex as he parachutes into the speeding sportscar of his bombshell girlfriend, Sapphire. Sapph is Stagg’s daughter, and hence the beginning of Rex’s problems. Simon is a disreputable businessman with a private army and an unhealthy protectiveness of his offspring. When he finds out about Rex’s relationship with Sapphire, he leads Mason into a trap. Rex is sent to bring back the Orb of Ra from an Egyptian pyramid, accompanied by Stagg’s personal assistant, Java the caveman. (Yes, Stagg defrosted a caveman and dressed him in a suit and tie–but no shoes–which should give you a clue that things are odd in this book.) Naturally, Java is obsessed with getting Sapphire for himself, and locks Mason inside the pyramid, exposed to the radioactive rays of a mysterious meteorite. That’s right, there’s a meteorite in the pyramid. The meteorite alters Mason’s body, turning him into a multicolored freak with the ability to transform into any of the elements found within the human body, as well as their compounds. He’s like Plastic Man, only much more versatile, becoming an invisible gas as easily as a copper spring. Mason is horrified by his condition, and spends most of his time trying to convince Stagg to find a cure for him. Simon, however, is an unrepentant prick with no intention of losing his new asset. For her part, the vain and self-centered Sapphire adjusts surprisingly well to her boyfriend’s new appearance, and remains faithfully in love. Besides, Metamorpho often has a lifelike Rex Mason mask on hand when the two hit the town. For most of the original book’s run, Metamorpho becomes a somewhat reluctant hero, going on missions for Stagg in between dates with Sapphire, with the ever-scheming Java dogging his track. Created by Bob Haney, Metamorpho is solid, ’60s fun, with a jokey sensibility that rarely veers into outright camp. His initial stories were illustrated by Ramona Fradon, an artist with a unique, cartoony style that I usually didn’t care for, but which comes off very well here. Unfortunately, Fradon left the book after the first few issues, and you can see the beginnings of a rapid decline soon after. By issue #10, Haney has introduced Element Girl, a sidekick/romantic rival that hints at the desperation to come as sales begin to fall. By the end of the run, the book takes a weirdly serious turn as Metamorpho ditches Sapph at the altar (for Element Girl, of course), then is put on trial for the apparent murder of Sapph’s subsequent husband. A conspiratorial element and a shadowy villain are introduced, and then…the book ends. Metamorpho has continued to make appearances over the years, at various times a member of teams such as the Outsiders and the Justice League. Several years ago, he finally made it into animated form on the TV series Justice League Unlimited. While he never received quite the notoriety he deserved, for a time he was one of the most unusual, enjoyable superheroes on the page.